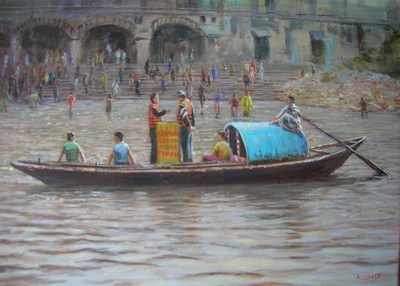 MAGNIFICENT ORIGINAL HIGH PRESTIGE OIL PAINTING "Biharis to the Ganges." BY THE FABULOUS ARTIST DAVID ALDUS. This spiritual painting shows the Biharis coming to the river Ganges to celebrate a religious festival. Aldus has captued the Biharis streaming down the old Victorian steps, drawn to the snaking river. Men and women ritually wash, some lather up till they are bubbly ghosts, and rinse themselves like speedy otters. Youngsters pose and splash, a large man floats past. Women anoint their babies!! Kohl-rimmed eyes flash, carmine lips pout and brightly coloured saris in the searing heat................. (Highest price received for one of his paintings is £14,000. "Lot's Wife" Absolute investment opportunity! ) Measurements height 10 inches by 14 inches Oil on prepared board. .